Driving from Detroit to Orange Park in fully packed station wagon, with 2 little girls in the back of the car playing, sleeping singing... we were thinking what's ahead, what to do first, what NOT to do....We were also thinking how to call our new business. We knew even then that name is very important. We saw the truck driving by with the sign "United" on it and I don't remember who said it out loud:"How about United Gymnastics Academy?" It makes sense: we wanted to teach all 3 disciplines to our future students: Artistic Gymnastics, Rhythmic Gymnastics and Acro-Sports. We will UNITE 3 sports!!! We had no idea that UGA stands for a very well known college in GA. But there were a lot of things we DID NOT know. As a matter of fact our upbringing, education and experience in Ukraine was all about anti-business and anti-profit. Businessmen were made known as evil, mean people who were taking advantage of workers, and "sipping" their blood. And here we are, becoming business people!!! On the previous visit to Orange Park Felix rented the apartment in "El Matador" apartment complex, next door to the Dog Track. Two bedroom apartment was clean, bright and empty and to say the least a little depressing. But we had blue phone that we kept from our apartment in Detroit, we had small table and 4 tiny chairs for the kids, some blankets and pillows, basic kitchen utensils. What else do we need? We had each other, our dreams and lots of hope! After paying Bob Salstone monthly rent, putting up all the deposits for the utilities, buying some necessities for the kids, we practically had nothing left on our account. November 1, 1980 we opened the door to our Gym. Our first students: Cindy Gossar, John Plunket and another boy whose name I don't remember came in. 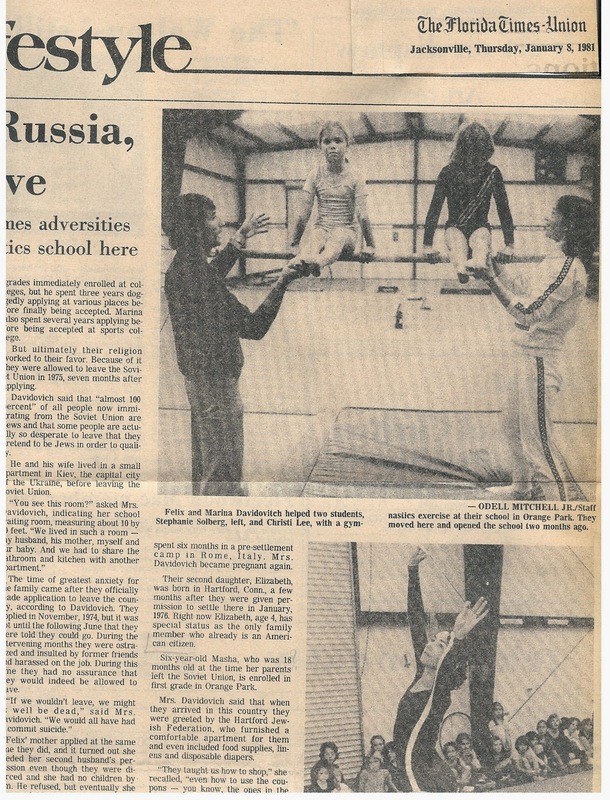 Apparently, Bob told all his students that he closes business and most of them, actually all of them went to another Gymnastics school, not too far from our Gym. But this did not slow us down. We conducted classes with enthusiasm, love and professionalism. Word got out. Next week we had enough kids to split students on 2 groups, and then we had more and more kids coming. Well, the manager of Orange Park mall did not share our enthusiasm. We got a very threatening phone call from his office and that was our lesson #1. Kids were very happy. Mashoonya went to Orange Park Elementary school and Elizabeth was in the Day Care, not too far from the Gym. After school they ate, took naps and played in the Gym. By December we had 30 students! Christmas Party was a success. We had Santa, exchanged gifts, danced, sang Christmas songs and I did a little demo of Rhythmic Gymnastics. And we had a local paper "The Florida Times Union" coming to do a story about us.